​Featuring an ethnically diverse cast, Majority Minority sets out to celebrate anyone who identifies as “other” while lampooning the ludicrous things white people get away with and to prove that brown people just know how to cook out better. This show, seemingly ripped from today’s ludicrous headlines, takes you to bizarre places including the secret lair of a cake boss who only bakes for the LGBTQ community and invites you to witness the inanity of situations like the crooked town hall meeting of a small Indiana community. 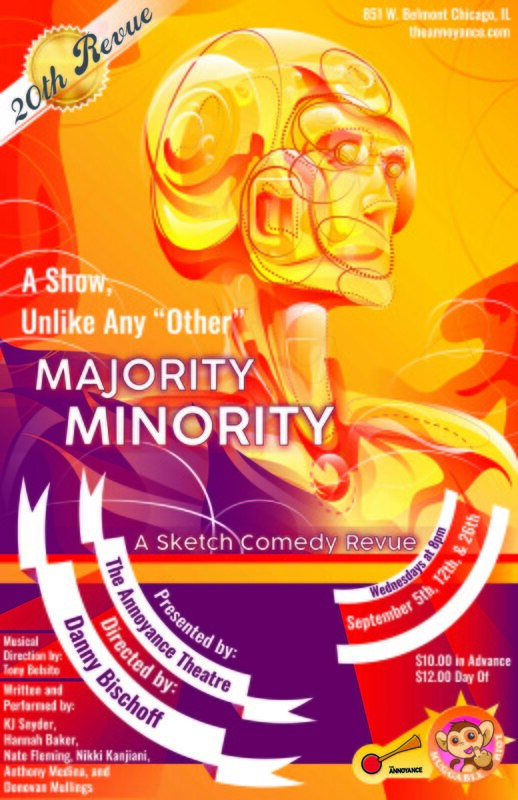 Majority Minority is directed by first time Huggable Riot director Danny Bischoff with music direction by Tony Belsito and stage managed by Jessica Thomas. Huggable Riot brings back writer/performer KJ Snyder and welcomes Hannah Baker, Nate Fleming, Nikki Kanjiani, Anthony Medina, and Donovan Mullings to the ensemble.